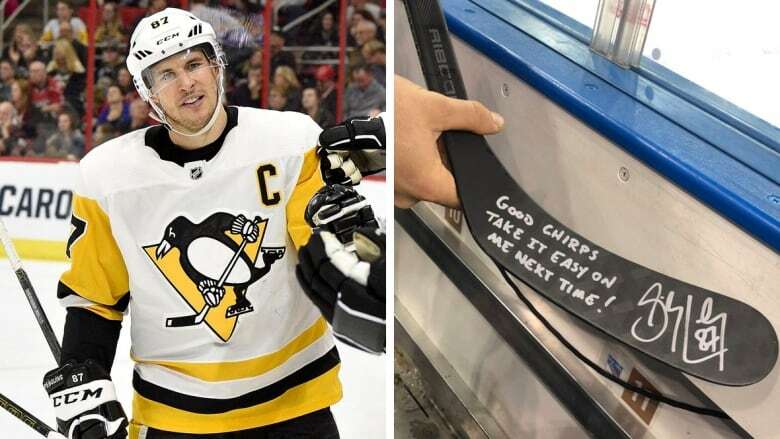 A loud voice and some creative material was enough for Sidney Crosby to take notice of a chirping New York Rangers fan on Wednesday night and reward him with an autographed stick. Having a loud mouth won't get you a lot of places in life, but it got one New York Rangers fan an autographed hockey stick and a great story for his pals. Nick Lipeika's persistent chirps at Sidney Crosby and the Pittsburgh Penguins during Wednesday's game clearly made an impression. Rather than overreact to the ridicule, Crosby played things classy. After the game he had the Penguins' trainer deliver an autographed stick that read, "Good chirps. Take it easy on me next time!" Lipeika's seats were right next to the penalty box, so Crosby couldn't miss him when he took a penalty in the first period. But Crosby didn't need to be in the box to hear him. Lipeika's trash-talking was loud enough to be heard throughout Madison Square Garden. But it was more than Lipeika's booming voice that made an impression. The material was all-star quality. On the flip side, Crosby was praised on Twitter for his good-guy move, likely made that much easier by virtue of the Penguins' 7-2 win in which the Penguins captain had a goal and an assist. I hate how much I don't hate Crosby.